Ex-Marussia driver Max Chilton dedicated his victory in the Indy Lights race on Saturday to his friend and former team-mate Jules Bianchi. The Frenchman, 25, died on Friday as a result of head injuries suffered in a crash at the 2014 Japanese Grand Prix. Chilton, who raced with Bianchi at Marussia in 2013 and 2014, dominated the race at Iowa Speedway to earn his first win in any series since 2012. "I probably thought of Bianchi every five or 10 laps," said Chilton, 24. "He was a driver destined to probably be a world champion," he added. The Briton said he had learned of Bianchi's death on Friday night US time before going on to take a victory which saw him lead for 87 of the 100 laps at the 0.894-mile oval. Chilton's win came as a surprise as he was sitting 10th out of 15 drivers in Indy Lights going into the weekend. This was Chilton's ninth race in Indy Lights, his previous best finish being third. 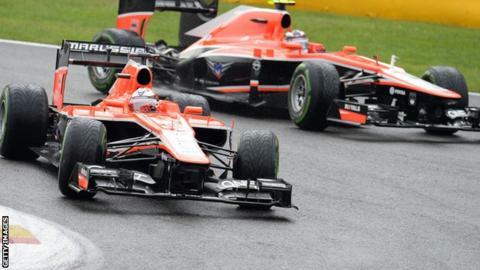 Bianchi had been in a coma since crashing his Marussia into a recovery vehicle at October's rain-hit race in Suzuka. As well as racing as Marussia team-mates for two years, the pair also competed in karting from the age of 10 before rising through the racing ranks together. The Briton tweeted yesterday: "No words can describe what his family & the sport have lost. All I can say is it was a pleasure knowing and racing you."